We would like to share a story with you about one of our staff members, Katya. It’s also pregnancy care story. Two stories for the price of one! Katya joined our team just over a year ago to keep our facilities clean and help us shine. Her first encounter with MTU, though, happened due to an unexpected pregnancy. It was about 9 years ago that I found myself facing an unwanted pregnancy. At that time I was 35. I already had 2 children from my first marriage. I was divorced, and I lived with my boyfriend in civil marriage. Well, our relationship was quite unstable. We went back and forth from living together and not living together. We fought a lot. We just had no stability in our relationship. I was taking care of kids. I was earning our living. I had loans to pay. I had two jobs. And it turned out unexpectedly that I had a small problem…this pregnancy - this baby - wasn’t planned at all. When they learned about my pregnancy at work, they said that I was an idiot and needed to immediately have an abortion - I wouldn’t be able to raise three kids. I had a very hard choice to make: to give birth and lose my job - or to abort this baby and keep my job. It was at that time I visited MTU. I met a counselor and was surprised to have no condemnation or anything like that. The only problem was that there was a real baby that I wanted to kill. It shocked me that at MTU they cared for my unborn baby more than I did. I talked to the counselor; I wept myself out and found new feelings for my unborn baby. I realized that it was a real baby and not a piece of something inside of me. I left MTU with the confidence that I will have this baby. My civil husband got excited about this news because he didn’t have children of his own. At work I did have some issues because of my pregnancy but somehow things have worked out. My pregnancy was going well, although doctors warned me that my baby could be born with disability because of my age and harmful working conditions, etc. MTU provided everything I needed to have this baby: diapers, clothes, bottles. I had everything I needed for my child and the rest didn’t matter, it was all in God’s hands. By God’s will my baby was born healthy. Relationship with my boyfriend improved greatly. Through MTU I came to know about a loving God. I repented of my sins. About a year later, on March 13, I accepted Jesus into my heart. And on March 17 my boyfriend and I got married. Now we had a high grade family. MTU provided such huge material help for us as we lacked money. Here we received baby food and clothes, shoes, also for me and my husband. With that support we could live. We have a nice close-knit family. I am very thankful for MTU and I thank God for bringing me here. Another miracle God performed in my life was to become a part of MTU’s team. Yes, they actually hired me to be part of the staff here. I absolutely love cleaning the office. It was far beyond my wildest dreams and expectation. I am in awe of an amazing team and incredible ministry carried out daily. My favorite part is to witness transformations happening in people’s lives: They come in tears, but they leave happy, having hope and joy. Huge thank you for your support. What you make happen is beyond words to explain and describe. Thank you. Feeding Revolution. Romaniv Orphans Need our Love ! I am so thankful to God for guiding MTU to the Romaniv Orphanage a little over 10 years ago to care for the boys and young men there. My heart breaks for orphans in my country, especially those with disabilities. Far too often they are left in the care of underfunded and untrained governmental staff. These orphans are isolated, lonely, and in pain. Orphanages such as Romaniv are still viewed by the big system as a ‘survival’ place for ‘almost humans’. We dream and pray that one day these young men will live in loving families. It hurts to see how voiceless they are crying out for love and care right now. That’s why our primary goal is to meet their basic life needs in medical care, healthy feeding and drinking, toileting, sleeping, washing hands and other self-care skills. We strive to to change their environment to stop abuse and neglect, make it a safe place of development and in and through all these efforts - reveal the love and care of Christ to them. Over the years it has been shocking to see that the critical need #1 of our boys has not been met – feeding and nutrition. Seeing them eat would always bring tears to our eyes. Some of us couldn’t take it…Some of you have seen this firsthand and can testify to that fact. Imagine: Hungry young men rush as a crowd of 30 people into the feeding hall, throw their clothes on the floor, some of them crying and screaming. It creates a sense of chaos, fear, and anxiety. Smell of food and excrement make you sick in the stomach. 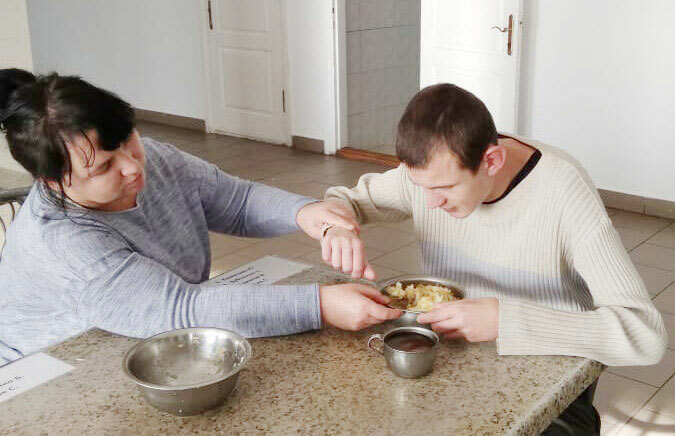 Two untrained caregivers are feeding at least 5 boys unable to feed themselves independently, watching the rest of the boys not to hurt each other, steal food or run away. So they just stuff the mouth of the young men with a mixture of courses with the speed light. Some young men throw food on the table and lick it like animals. Others eat from the plate with their mouth. Most of the boys swallow food in big lumps. You turn around and you see a boy vomiting, another boy falls on the floor screaming. At the same time another one is having a seizure. Still others take a chance to steal food from their neighbors. Everything happens in a big hurry. My heart was broken that the first thing to be of pleasure was a horrible and stressful experience for our young men. As a result they experienced aggression, diseases, physical and emotional pain, tears, creaming, constant feeling of hunger, absence of self-care skills. I was overwhelmed with shock, hopelessness and frustration, but the desire of change was stronger. A few months ago a team of MTU specialists and orphanage staff developed a plan how to make feeding a process of pleasure. Now our youth come to the canteen in groups of 15. Caregivers, teachers and volunteers, when being in Romaniv, help feeding the boys. All involved are watching the texture of the food, the speed and teach the boys to hold a spoon and feed themselves. There is peace and quiet in the canteen. No hurry, no fear that your food might be stolen. Strangely enough as a bonus - there is only smell of food now. It does add work to the orphanage staff, but everyone agrees there is no way back. So the boys are still in the institution. And we want to make everything possible to change their lives for better. Pray with us to change the young men’s living environment, so that there would be no abuse, no isolation, no pain. Pray with us that the love of Christ is evident in our lives as we minister at Romaniv. Pray that the boys sense God’s presence! I am right now in Ukraine and have just returned from visiting the camp for disabled children MTU puts on each year. It has been a challenging week for over 170 children, parents and volunteers. The conditions are difficult to begin with but even more so this year as the camp has experienced illness, rain every day and the loss of power and water for 1 days due to lightning strikes. You would never know it was difficult by looking at the campers and the 40+ volunteers, some Americans, some MTU staff, but mostly college aged Ukrainians who give up their vacations, free time and the opportunity to earn much needed money all to come to a camp with 2 “showers” and just few more toilets. But what happens here is something you must see to believe. Children mostly shunned in public are each assigned a personal volunteer and the sole job of this volunteer is to love this child like they are loved by Jesus. These children are most lovable, but not always easy to love. During the week the volunteers will carry them or wheel them to meals, wipe their noses and faces as needed and cheer their every move and accomplishment. For this week the child is not a “disabled child”…but instead a beloved child of a King! Every child is assured to “win” one of the activities and every child receives a medal and does a victory lap in the Special Olympics while hearing their name chanted by hundreds to applause and shouts of “way to go”. The parents watch all of this and there are ALWAYS tears! It is obvious that deep wells of running water have landed on some very barren land. They can finally release their children to the care of another, they can finally rest…they can finally laugh! Is it any wonder they are more than willing to hear whatever they can about this Jesus who generates such a miracle. This is my 16th camp. It never fails to encourage me. It never fails to challenge me. Today, I saw Light overcome darkness (Acts 26:18) at a camp in the woods of Ukraine…and I will never be the same, I don’t ever want to be the same. Friends, prayer warriors and supporters, this year 105 children with disabilities and 84 parents\caregivers attended MTU overnight summer camps. 96 volunteers and 15 MTU staff from over 25 churches both US and UA served families with children with disabilities and orphans. 13 caregivers and 11 children prayed to receive Jesus, 8 people renewed their commitment to follow Christ. Let’s continue to pray for the seeds planted to grow in their hearts and bring fruit hundredfold. 33 volunteers from 6 different locations received training on leading small groups to be empowered and encouraged in leading Bible studies for our women who chose life for their babies. Ludmila, volunteer from Zhitomir: “It was important for me to hear that leaders need to find time for rest and fellowship with God. It is very important to find an approach to every person in a group. I am grateful for the team of US friends and for such inspiration for us." 3 day Camp for Pregnancy Care women in Zhitomir. 37 women attended a 3 day camp organized at MTU facility. 24 of them attended a day camp for the first time in their lives. Stories of the women in the Old Testament helped our women see that God can use their lives for His glory and that they are valuable and precious in His eyes. Thanks to camp our women built friendships, learned to support each other, grew in their faith, and received encouragement to connect with local churches. Olga, 31 year old pregnancy care mother: “During Bible lessons I heard and realized everything that has been happening in my life has a special purpose. God sees my circumstances. He has a special plan for my life. He teaches me to be a strong woman and have confidence in my life, just like Deborah had. It was important for me to hear the stories shared. I saw my story in them and know God continues to shape the story of my life. 72 volunteers from different locations and regions got together to celebrate God’s victories in ministry in the first six months of 2018, to fellowship and worship, to learn more about care for their souls, and rest. Thank you, Women of Grace Church for being sincere, devoted, and sacrificial. Thank you for serving alongside the MTU pregnancy care team with your gifts and talents. You truly expand His Kingdom to the ends of the earth.